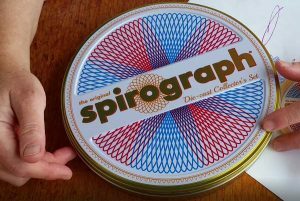 My jaw dropped when I first saw that Kahootz was bringing out a die-cast metal version for Spirograph’s 50th anniversary. So I was delighted when they offered to send me a set to review. I saved the unboxing for the camera, so the video shows my genuine reactions, real-time fumbles, oohs and aahs. It’s a really classy set with the feel of quality, and very nicely packaged. The wheels feel, and clink, like the coinage of a country where a pound used to weigh a pound. (Hello, UK?) They shine like gold bullion. 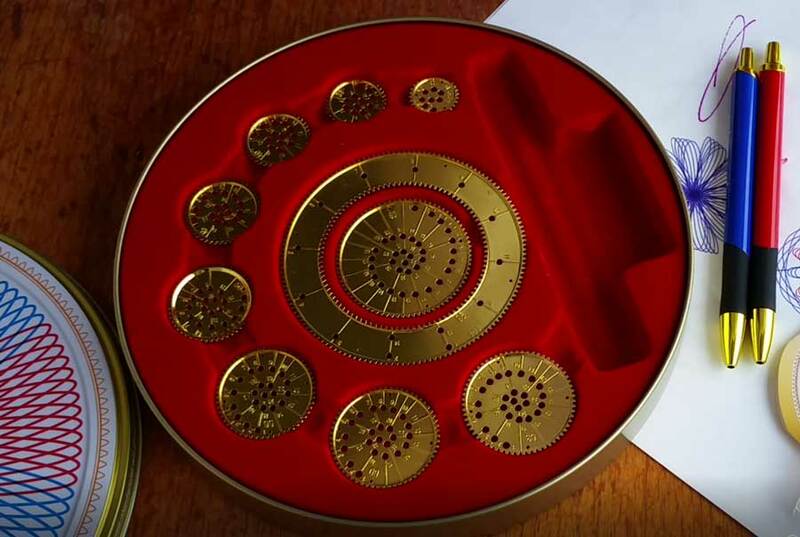 The metal tin has a pressure-fit lid, like a cookie tin, and flocked liners hold everything in place even when you shake it. There’s no problem with warping as in the new plastic sets; the metal pieces are flat and will stay that way as long as you keep them out of Mount Doom. Speaking of Lord of the Rings, there’s just One Ring. Does it “rule them all”? Maybe not. I enjoy having all the different patterns you can make with more rings. (If you’re really hooked on gazillions of permutations and combinations, check out Wild Gears). However, I realized as I made the video that most people will be perfectly happy with just one ring and a smaller selection of wheels. It’s still an awesome toy for adults and kids (over 8 or so). Many people might even have more fun with a smaller set like this, if they find that too much choice makes it harder to get started. It would make an absolutely brilliant gift for someone who had Spirograph as a kid. Spiro-putty is included as with the plastic sets. However, small pinholes, like in the old Spirograph sets, have also been made in all the wheels. Pins are not included, but you can buy map tacks if you really want to do it the old way. If so, see my article about using corkboard as a better working surface than the corrugated cardboard of the old sets. You can still use whatever pens you want, the same as with the plastic sets. 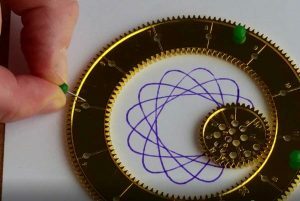 My only disappointment with the Die-cast Spirograph Collector’s Set is that, like the new plastic sets, it is not engineered quite as well as the old sets. 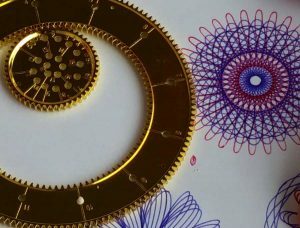 The way the holes line up with the teeth, and the spacing of the holes from the edge of the wheel, are less precise than the old Spirograph. The consequences can be seen in the red drawings near the bottom of this review. This is a rather minor point for most people, however, and does not detract from the fun and educational value to be had. 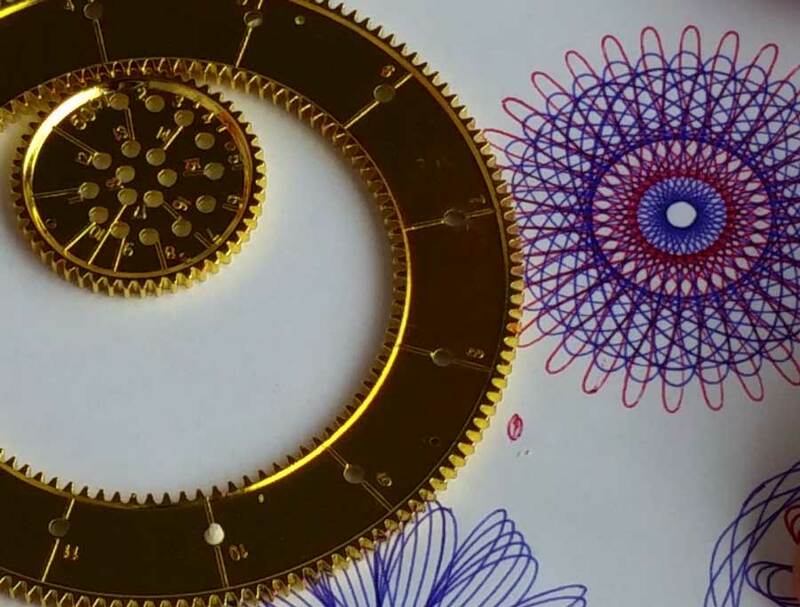 Serious spirographers are still better off finding a second-hand Super Spirograph (try eBay) or exploring Wild Gears. 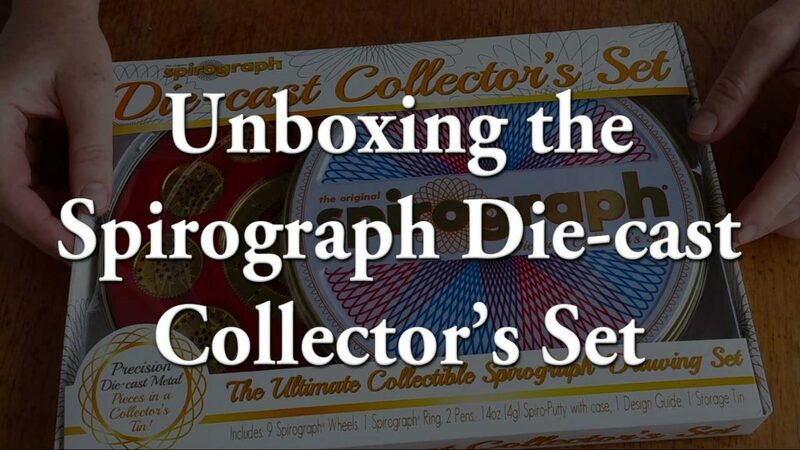 But for the average person aged 8 to 88 and up (and younger kids with help), this Die-cast Spirograph Collector’s Set is a fantastic drawing set and a wonderful gift. is it really metallic or just metallic coloured plastic. metallic will be much stronger and long life but simultaneously nontransparent. It’s definitely metal – it’s so heavy! I haven’t used the parts enough to find out whether the golden colour will scratch off eventually or not, but it’s all metal. yeah. i got assured after watching the video about the quality it gives us.